This remarkable book pulls off the tricky feat of making us care about characters in two separate narratives, with neither one feeling like filler or killing time before returning to the important part of the story. 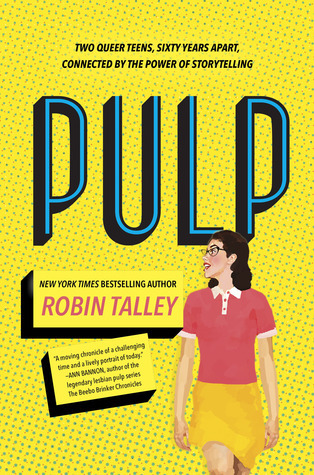 In Pulp, we follow a contemporary storyline about a high school senior, Abby, who is out and proud and very matter-of-fact about how diverse and free her world is. Most of her friends fall somewhere within the queer rainbow, gay, bi, non-binary, and various permutations of all sorts. And it’s all good. Abby is part of a close-knit group of friends who delight in being politically active, attending rallies, fighting for justice, and making demands for society to be better than it is. Abby’s life is not perfect, though. She still pines for her ex-girlfriend Linh, she’s stuck on her senior project, and her parents are doing a lousy job of hiding their inability to tolerate one another. She chooses the topic of her senior project at the last possible second, deciding to study lesbian pulp fiction of the 1950s and write her own version of these novels, inverting the tropes that were mandatory in the genre. In the historical timeline, we meet Janet Jones, also a high school senior, whose life is highly regimented by her overly protective and rigid parents and their world of country clubs and social correctness. Janet stumbles across a lesbian pulp paperback, reads it, and realizes that these unnamed feelings of hers are actually shared by other people. She becomes desperate to connect with the author of one of these books, and at the same time, realizes that her feelings toward her best friend Marie are much more than just friendship. The two narratives intersect in fascinating and unpredictable ways. Janet’s storyline is the more upsetting of the two for much of the book, largely because the world it shows is so hostile and repressive. Pulp does an excellent job of showing the terror of being gay at a time when there were no legal protections or rights for anyone who dared step outside the bounds of “normal”. Set during the Lavender Scare, this novel shows good, decent, hard-working people being hounded out of their families and jobs, spied upon, and having their lives ruined, all because of who they love and how they identify. Being closeted was a necessity, and the danger of discovery drove countless people to deny their own identities out of a desperation for survival. Through Abby’s eyes, the awfulness of the 1950s for the LGBTQ community is especially vivid, as Abby’s modern perspective is challenged by her research into what others’ lives once were like. Seeing Abby come to realize the importance of the brave people who created new ways to live, form a community, and remain true to the themselves is quite beautiful. I was less invested in the love story aspects of both Abby and Janet’s arcs, but very much loved getting to know them as people, to appreciate their challenges and strengths, and how each struggled in different ways and at different times to find themselves and to find a way to lead an authentic life. Pulp is both a great novel and a great lesson on 20th century history. Reading about this chapter in LGBTQ history is moving and upsetting. The world has come so far, and there’s still a long way to go, but I think especially for the target YA audience, Pulp provides a fascinating and important perspective on social action, diversity, and identity.